Two years ago, leaders from the University of Wisconsin- Milwaukee, Milwaukee Public Schools and Milwaukee Area Technical College publicly announced a groundbreaking educational effort called M3 (pronounced M-cubed). It’s an unprecedented collaboration among Milwaukee’s three largest public education institutions to create a better K-through-16 educational system, one that will feed the region’s growing need for college-educated employees. In January, M3 leaders hosted an event highlighting the impact the initiative has had so far. 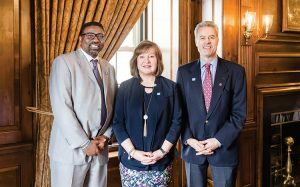 UWM Chancellor Mark Mone, MPS Superintendent Keith Posley and MATC President Vicki Martin shared how M³ has helped increase the MPS graduation rate and the percentage of MPS grads going on to college. They also committed to accelerating the progress and to moving the needle in one area that has not yet seen growth: the one-year retention percentage for MPS graduates who attend either MATC or UWM.